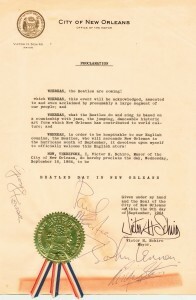 It was 50 years ago this past Tuesday night that Beatlemania came to New Orleans and the four lads from Liverpool – John, Paul, George and Ringo – made sure that the Crescent City would never be the same. 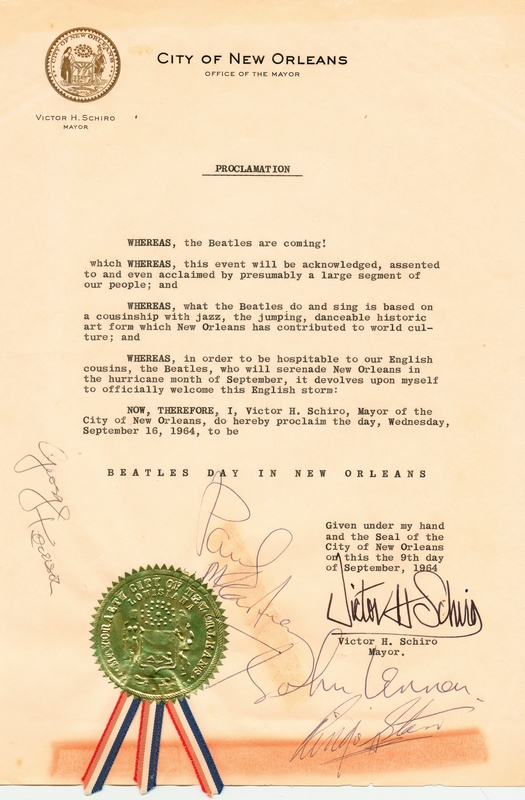 The date of September 16, 1964 would have been just another sleepy day in the humid, sprawling complex known as the Crescent City. But for those few thousand who assembled at City Park Stadium, there was history to witness and songs to hear above the din of hundreds of young ladies screaming at the four mop-topped performers. The Beatles had arrived at the outdoor arena “protected” by members of the New Orleans Police Department, who had no idea of their charges’ attractive nature to pre- and post-pubescent girls. The Beatles has long been fans of the fabled “New Orleans sound” – in particular the songs engineered by the late Cosimo Massina – by studio artists like Fats Domino, Little Richard and the late Larry Williams. Foolishly, they thought they might have time to sightsee the city, but an added concert on the tour nixed that opportunity. Their fame was so great that these weary travelers from England would never again – as a group – visit the relatively small, yet musically important city before calling their concert tours finished a little over two tours and two years later. One of those who longed to be in the crowd was a nine-year-old Bruce Spizer, a young Jewish New Orleanian who had repeatedly heard several of their popular songs over the local radio stations like WTIX and, as all America, had witnessed their triumphant three TV appearances on the Ed Sullivan Show in February. Spizer, is today a successful attorney, but he most certainly would regret that missed opportunity as a youngster. “Of course, they never came back,” he mused. Despite that miss, Spizer would go on to become an authority on most every aspect of The Beatles’ recording careers and their personal lives. How that happened has a great deal to do with his love of the Fab Four and his skill as an attorney. Following several years working as an attorney at several law firms, Spizer started his own firm, specializing in taxation and estate planning, in 1984. He worked long hours and several years on a major class action suit in which he sued to restore a percentage of benefits to retirees at a company. His fee of $450,000 was paid by the insurance company he represented. So what to do with such a major fee? Spizer looked at his wall and his collection of records. There was a glaring problem caused not by beetles, but by another form of more well-known New Orleans insects. “Roaches had eaten the spines of my Beatles albums,” he remembered. “They left ‘Meet the Beatles’ alone and they didn’t touch Abba or the Beach Boys.” But all the others were heavily damaged. Intent on replacing the exact records he had purchased as a youth some two decades earlier, Spizer started doing research to locate the replacements. When he began boning up on the subject matter, he found out about subtle and major differences between the monophonic and stereo recordings as well as variances between the recordings released by Parlophone in England and EMI and Capitol Records in Canada and the U.S.
Research led Spizer down a long path of illumination. “That was the nice thing about having your own law practice,” he admitted. 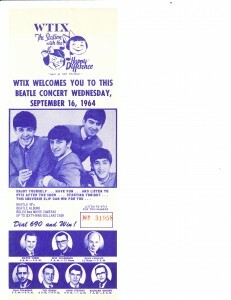 He began to collect albums, promotional posters, buttons, memorabilia and photos from fellow collectors and reasoned there were many other clueless Beatles fans who could benefit from what he had discovered and collected. Spizer reached out to a graphics designer and others who had publishing experience. 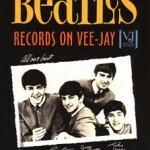 He labored for myriad hours and prepared materials he would eventually self-publish on his 498 book label as “The Beatles on VeeJay Records,” the first of eight different hard cover tomes that in intricate detail have catalogued the recording careers of the most famous rock band of the Sixties era. 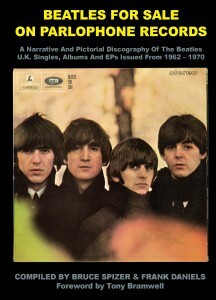 He followed up the enormously popular first book with two books, “The Beatles on Capitol Records,(Volumes 1 and 2)” followed by “The Beatles on Apple Records.” He then documented events leading up to and including The Beatles’ initial tour to America in 1964 (“The Beatles Are Coming”) before authoring a book on the solo work of individual Beatles under the title “The Beatles Solo on Apple.” His penultimate work was “The Beatles on Swan Song,” which was the last book regarding the domestic releases of the Fab Four. 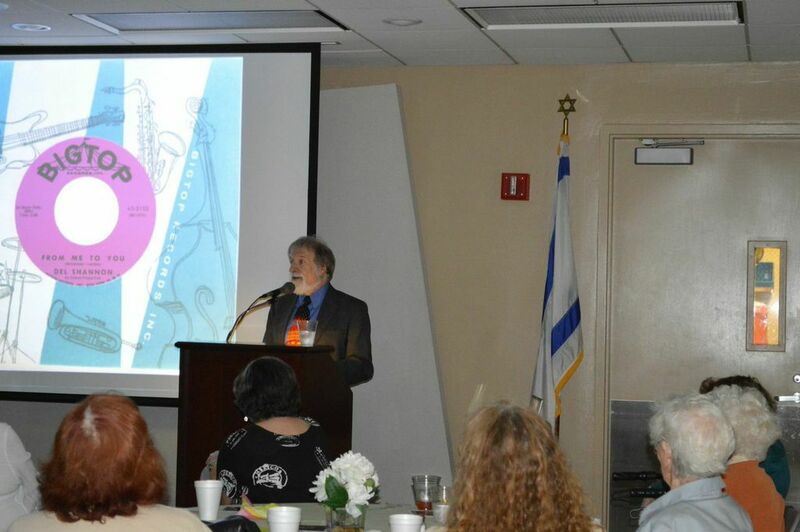 Spizer regards his training as an attorney and the ability to interview subjects under deposition and conduct research as among the best tools he possesses as an author. He reckons that each book took about a year from conception to publication. 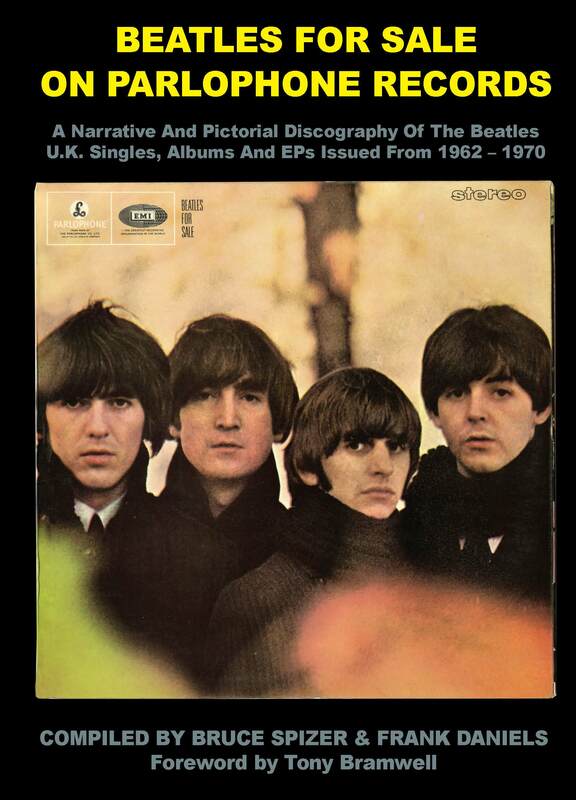 “I primarily was just collecting the U.S. albums and didn’t collect the Parlophone Records until I started writing my book on Parlophone, “Beatles for Sale on Parlophone,” he went on. 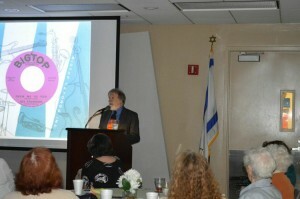 All of this expertise has brought Spizer invitations to speak at various Beatles conventions across the globe. He has been recognized as a Beatles authority and revered for his time-consuming research. And he’s a fairly upbeat talker who makes the subject matter sparkle when he speaks. Today Spizer is so highly respected that he consults with EMI, Capitol and Apple Records. He even wrote some of the liner notes for a recent compact disc reissue of The Beatles work on Capitol Records. He’s even being consulted on future releases with the companies. That’s a far cry from being a closeted fan, he acknowledged. 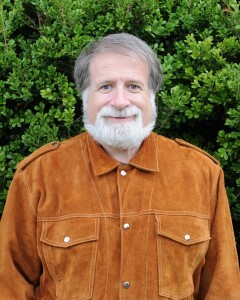 In order to handle the sales of his many books and to connect Beatles fans, Spizer created his website Beatle.net years ago. 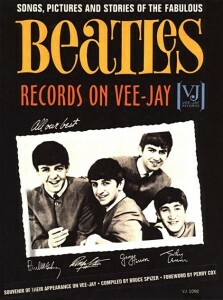 He has brought his writing full circle, now offering his out-of-print “The Beatles on Vee-Jay Records” as an e-book. It includes includes new stories and updates not available at the time of its initial publication. He hopes to reissue all of other works as digital downloads eventually. A week ago Spizer attended the WYES-TV Beatles Tribute Concert featuring The Fab Four tribute band that appeared at Tad Gormley Stadium on the exact 50th anniversary of their only appearance in New Orleans. When asked in advance if he would attend, he answered succinctly: ” After missing out on The Beatles 50 years ago, there’s no way I would miss this.” He didn’t.